(ii) One (1) copy of the University of Uyo 2018 ONLINE registration form duly completed with the passport-size photograph printed in colour. Sir, Do They Require The Original Copy Of My Waec Result?.. And For The Photocopies.. Can I Bring The Photocopy Of My Original Result? 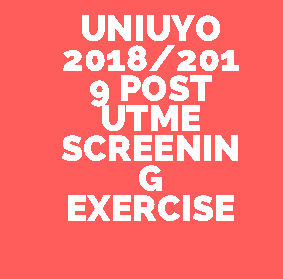 during screening will there be any writing of exam or any exam question asked? plz I had 239 in jamb, do I stand a chance for LAW? Please is there going to be exams or only screening this year?? Please, Can someone with Bsc in Biotechnology apply for direct entry to medicine and surgery, and what level would he start?